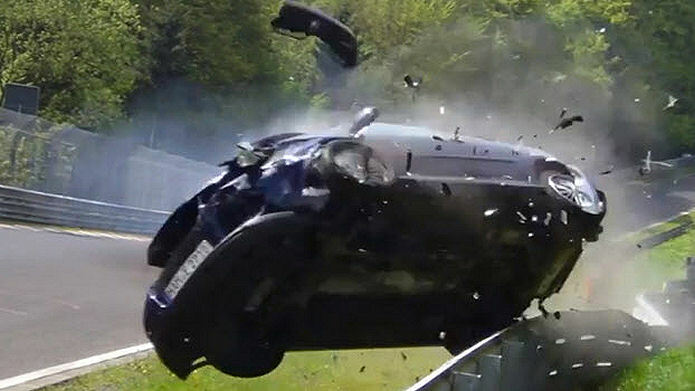 Check out this compilation of recent Nürburgring car crashes. Some drivers are overly ambitious, but not all of them. For every person who ends up in the grass after entering a corner a little too hot, it seems there’s at least one other person else who spins out in weather conditions way beyond their control. Perhaps it’s the quick tension of the initial loss of grip, and the release of the inevitable shunt. Maybe there’s something mesmerizing about seeing car after car lose it in the same corner. From Wikipedia: Nürburgring is a 150,000-capacity motorsports complex located in the town of Nürburg, Rhineland-Palatinate, Germany. It features a Grand Prix race track built in 1984, and a much longer old “North loop” track which was built in the 1920s around the village and medieval castle of Nürburg in the Eifel mountains.